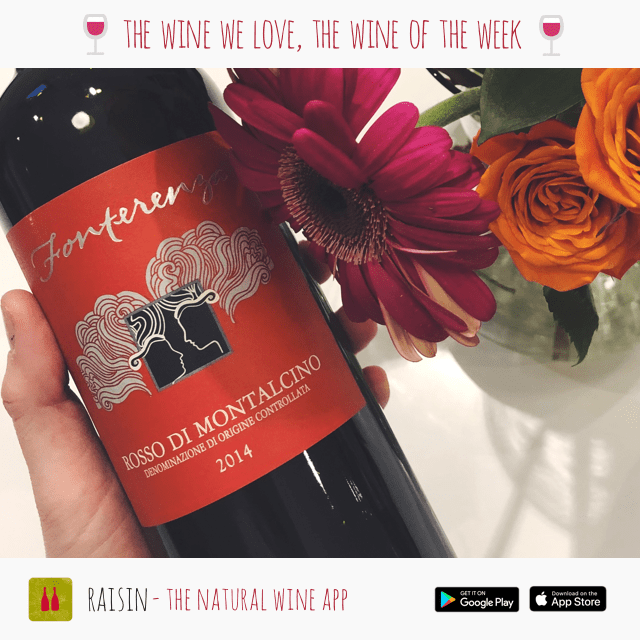 Twin sisters Margarita and Francesca Padovani are true cupids , making wines that you are sure to fall in love with since 1997 on their charming 4 hectare biodynamic estate – which sits 1,300 feet above sea level on rich quartz soils.  Discover La Buvette Levitation: a new recommended restaurant, bar, and wineshop in Martigny, Switzerland La Buvette is a unique place where a skate shop and a natural wine bar live together in an old print shop – and the vibes go hand in hand. Levitation also happens to be the first skate school in Valais! A happy mixture of different genres that brings together all kinds of passionate people. Cozy alcoves in the café make it always a great place for apéritif, with delicious tartines and good wine to match, natural of course! 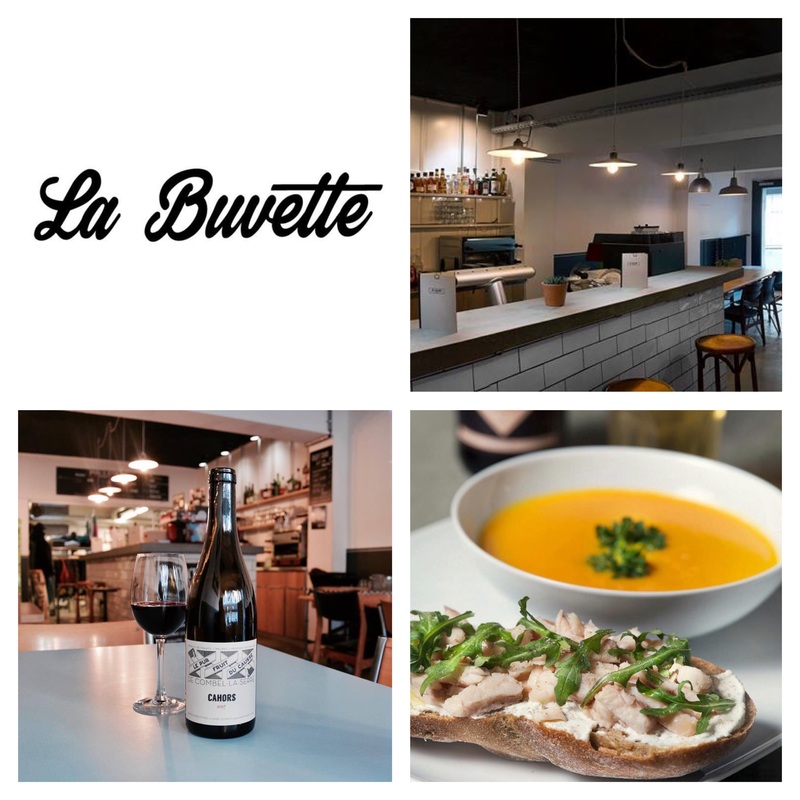 We also would like to thank La Buvette for their financial support using the fast registration⚡ process, which promises a 48 HOURS GUARANTEED REGISTRATION to appear quickly on our map of recommended establishments around the world with 30% minimum natural wine. A modern take on Alsace Riesling.The Geschickts in Ammerschwihr, are one of the foundation stones of natural wine in Alsace. The 12 hectares of vineyards have been farmed with biodynamic principles for 20 years. The domain is run by Frederic who took over the reins of the family business in 1993, his nephew Arnaud, and Aurélie Fayolle (Arnaud’s partner, who runs the commercial side of things). Frederic also holds the lofty position of President of Demeter, France. A body that manages the biodynamic certification scheme for all types of agriculture, not just wine growing and wine making. 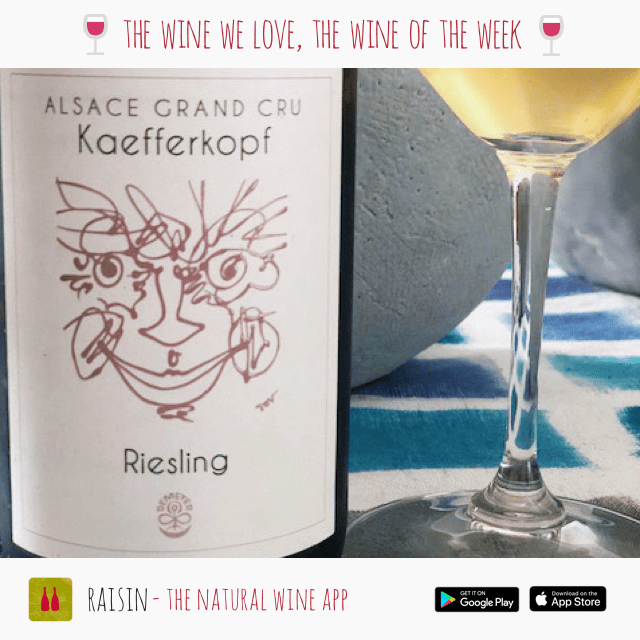 Now for the wine – 2014 Riesling from the Grand Cru Kaefferkopf, a 71 hectare vineyard that is split into four sections surrounding Ammerschwihr. This Riesling comes from plots in the mostly clay limestone area of the Kaefferkopf. The wine is raised in barrels for 36 months, maturing patiently on the lees, with no filtration at bottling. This millésimé had an expected dark gold color from the barrel age and a well pronounced bouquet of ripe white fruits and pears. A lovely weight and structure on tasting, with a slight smoky touch. A dry finish with a lingering salinity. Fabulous long tears of glycerol as the wine warms in the glass. 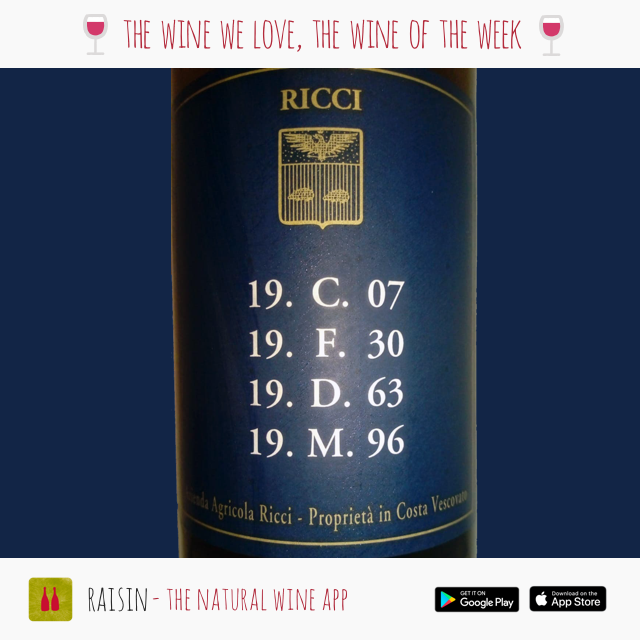 The wine has that fascinating horizontal structure, something that the natural wine methods bring out. This makes it quite different from these tight, racy, nervous dry Rieslings, that are supposed to be the standard of quality. The approach produces a wine that is alive with an energy and a nice weight in the mouth. It’s kind of crunchy, “croquant” in French. We ran this into a carafe to help open it up and also to enjoy the fabulous color. An avant-garde Riesling defining a key aspect of modern Alsace. The vintages of the Geschickt Kaefferkopf Rieslings are delicious to drink at 4-5 years of age, but will easily keep and mature for an additional 5-10 years. 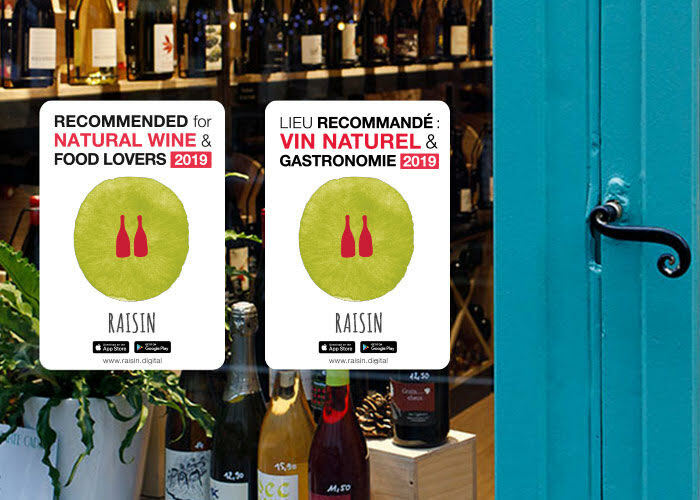 THE RAISIN STOREFRONT STICKER HAS ARRIVED  : Recommended Raisin establishments can officially show off their devotion to natural wine and good things, to all the foodies in the neighborhood. 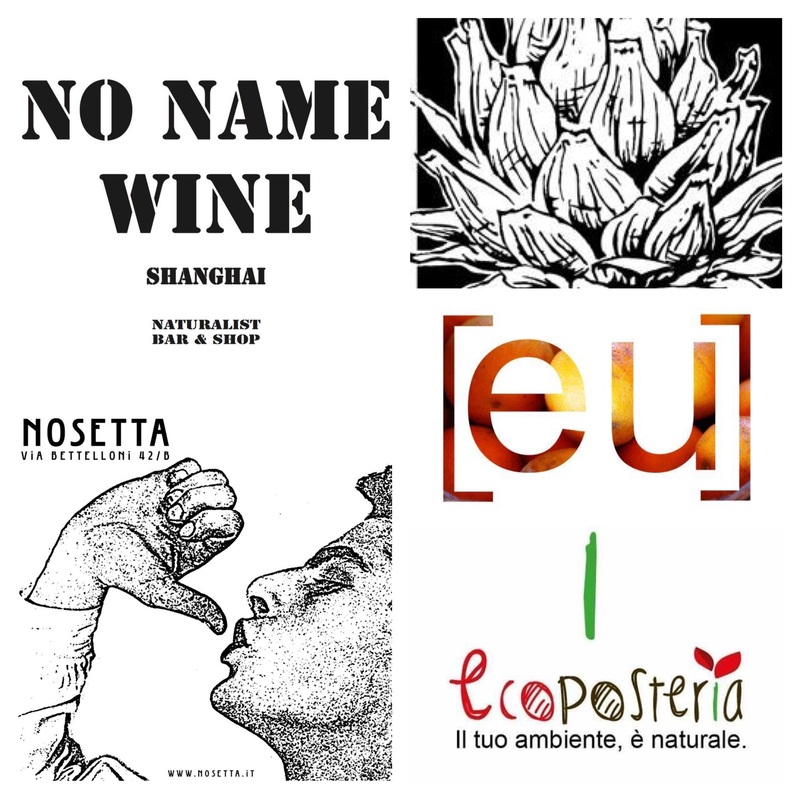 Because where there is natural wine, you are guaranteed to eat well too  All you have to do, is stay on the lookout for this sticker, and you’ll know where to go!